These were the shoe choices I selected off my rack for Niles and Jenn's wedding. The tan ones are the ones I bought for Carole's wedding. The white sandals I got for her college graduation. The red ones I've had for decades. They were, at one time, my favorite shoe. They were comfortable and stylish. The problem is, they don't fit comfortably anymore. I've had some problems with my feet in the past year which I've come to understand is part of having RA. I'm also told that once I get stabilized, the twinges, the cramps, the odd feelings of sand on the soul will go away. There is no guarantee, however, that what I was able to wear, I will be able to wear again. So, what do I do with these? 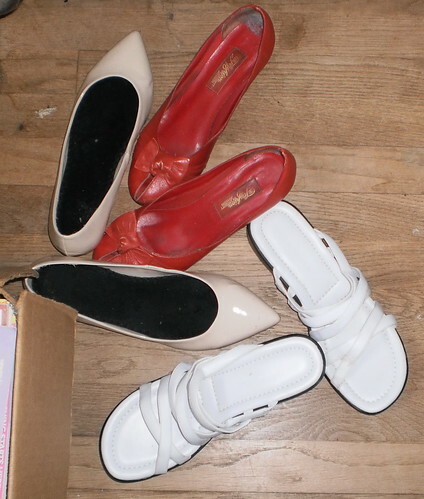 I'll keep the tan ones but what about the other two and the other pairs hanging on the shoe rack? Do I just give all those away? I'm on the fence. The red ones have a history with them and it feels like giving away that history. The white ones, meh. They are nice shoes however and perhaps saving them for another couple of months while medications get sorted out isn't a bad thing. It's not like I have them spread out all over. They all hang on a shoe rack which is on the back of my bedroom closet door. In the drive to rid myself of unnecessary stuff, a shoe rack 80% filled with shoes I no longer wear would be at the top of the list. I found myself pulling them off, looking at them, and remembering why I wore them and where. It's probably, then, too early to move these into the give away bag. Back on the rack they go.